Showcase your sartorial nous with this exquisite timepiece from Hugo Boss. Built with stainless steel casing, this watch’s blue dial and gilded markers is stylishly juxtaposed by a sleek leather strap, bringing a touch of panache to your everyday styling. 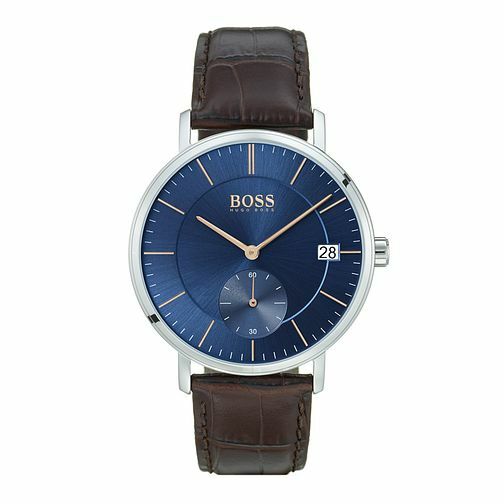 Hugo Boss Corporal Men's Blue Strap Watch is rated 5.0 out of 5 by 1. Rated 5 out of 5 by Anonymous from Beautiful I completely love this watch. I was bought it as a 21st birthday present and im so glad, as it goes perfectly with all dark blue outfits, which i have several of. Its action is quiet and nog distracting and the strap is comfortable and will fit a great range of wrist sizes. Ive already had a number of compliments over it after a few weeks.